Goji berries, also called wolf berries, come from Northern Asia, mainly grown in Tibet. They come in dried form, much like cranberries or raisins — but have a rough texture and a tart, smoky flavor. Don’t let their tough exterior fool you, these little wrinkled berries are seriously beauty food. They have 20 times the antioxidant power of prunes (that already rank extremely high in antioxidants) and contain over 3 times more than blueberries. Set out a sheet of wax paper on a plate. Place 1 cup of bittersweet chocolate chips along with 2 tablespoons of skim milk in a small saucepan. Melt over low heat, 3 to 4 minutes stirring often. Cut two bananas in half and place a small skewer in each, starting with the cut side. Use a spatula and smear the chocolate over the banana. 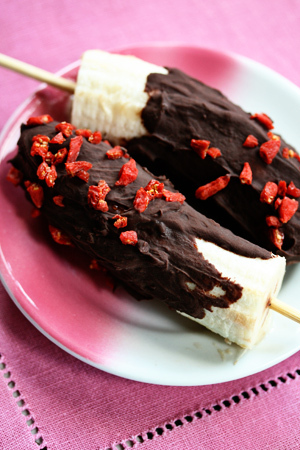 Sprinkle each banana with 1 tablespoons of chopped goji berries and freeze. Gojis aren’t just good in breakfast cereal, they make an amazing salsa when paired with fresh chopped cherries, lime and cilantro. Try adding them to your favorite tomato-based salsa or fruit salsa. Gojis are great sprinkled in salads but they are delish in sandwiches too. Want to boost anti-oxidants in your peanut butter sandwich? Sprinkle 2 tablespoons of goji after you smear. Or stir a few tablespoons into your mayo for a tasty BLT. Prefer to drink your fruit? Gojis are cool in smoothies, but you can also add them to your favorite red sangria recipe. Chop in the food processor and add to a no-baked graham crust. Want to bake with gojis? Make sure they aren’t directly exposed to heat, they burn easily. Fold them well into the batter to protect their delicate texture or top cookies and brownies with whole berries toward the last 5 minutes of baking.